Connecting Norse mythology, ecstatic trance, the Universal Mind, and the dawn of a new age of peace and veneration for Mother Earth, Nicholas Brink reveals how we can use ecstatic and hypnotic trance to learn more directly and deeply from our distant ancestors, rediscover our extrasensory powers, and reclaim the original magical nature of humanity. The imminent rebirth of a peaceful, balanced, connected world was predicted in Norse mythology as the return of Baldr, the gentle and compassionate Nordic god of truth, healing, and rune work. Illustrating ecstatic trance postures to connect with the ancient Nordic people and their beliefs, to journey to exact points in time, and to access specific powers, such as seeing into our future, Brink explores humanity's evolving cycle of consciousness from the era when the Great Mother goddess was the center of life through the transition to the worship of power and physical strength in the Bronze Age and the world of the Vikings. 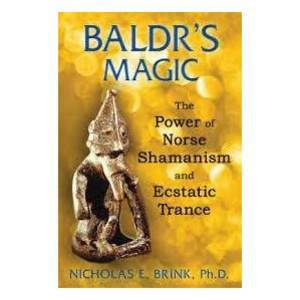 He explores the coming return of Baldr and the imminent new age of peace and respect for the earth. Through hypnotic divination, the author expands the stories of the early Nordic gods and goddesses from the Prose Edda and the Poetic Edda, in particular the fertility deities of the Vanir, such as Freyr, Freyja, and Idunn, who came before the warrior deities of the 'sir, such as Odin, Thor, and Loki. He details the epic battle of Ragnarok and the birth, life, death, and rebirth of Baldr. Brink shows how these ancient stories happen outside of time, in the past, present, and future, thus Baldr's return is replayed in our death-rebirth experiences of life, in each dawn, with each spring, and now with the birth of a new age that we see happening all around us. Through the power of trance at this time of rebirth, we move full circle to reclaim the magic of the earliest times, the times of the Garden of Idunn.